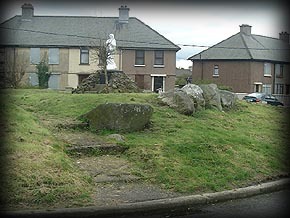 The passage tomb at Abbeyquarter North is amazingly situated on a roundabout in a housing estate named Garavogue Villas in the centre of Sligo Town. The tomb is the same type of boulder circle seen not too far away at Carrowmore with an original cruciform shaped chamber at the centre. During the last century the Catholic Church tried to have the monument removed, but because of local fear (the monument is also known as Garavogue fairy fort) nobody would help remove the tomb. 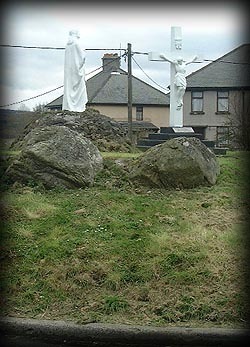 The Catholic Church erected several statues on the roundabout during 1950, the year of the assumption. So we now have this rather odd looking monument pictured below. If you are in the area I recommend that you visit this unique megalithic site. Situated: On a housing estate in Sligo Town, head for Sligo Abbey and follow the Garavogue river to Garavogue Villas. Discovery Map 16, 25: G 6998 3575. Last visit Sept 2010.